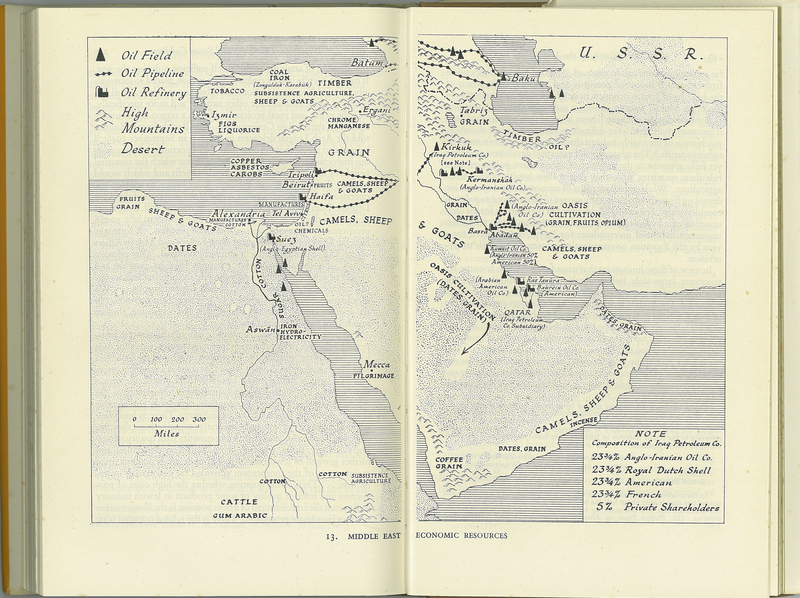 This map provides a basic guide to the economies of the countries of the Middle East in the mid-20th century. At that time, dates and cotton led the economy in Egypt. Today, the Egyptian economy is based around agriculture, natural oil and gas recovery, and tourism with almost 15 million people visiting each year. The country still produces the most dates of any worldwide and has a reputation for producing the best cotton in the world – an industry that was developed in the early 19th century by French entrepreneur, Monsieur Jumel, and the then Ottoman ruler of Egypt, Muhammed Ali. Note the map is pre-Suez Canal construction, a structure that now provides Egypt with five billion dollars of revenue per year. George E. Kirk, “A Short History of the Middle East: From the Rise of Islam to Modern Times,” ourheritage.ac.nz | OUR Heritage, accessed April 24, 2019, http://ourheritage.ac.nz/items/show/10725.